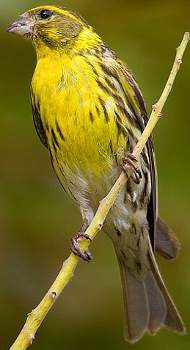 The male Serin is a bright yellow, canary like bird with yellow head and breast, heavy streaking on the flanks and a greenish-brown coloured back. The Serin is a bird of warmer climates, a resident breeder in Southern Europe and a summer visitor to central Europe. A rare vagrant to the UK. The Serin's favourite habitat is orchards, vineyards, olive groves and gardens. 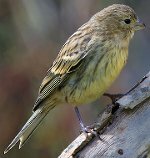 Escaped domestic Canary can often lead birdwatchers to believe they have found a Serin, especially as young Canary has the same streaking and facial marks. This image illustrates the birds bright yellow appearance, note the heavy streaking on the flanks and the brownish crescent marked face. The birds forked tail is not very clear in this image which is often the case until the bird takes flight. 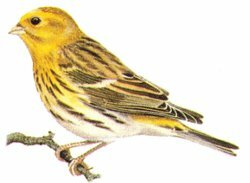 Like most Fringillidae the female Serin is much duller than the male, she has paler yellow, if any, on the head and breast although her rump is usually like the male, a distinctive yellow. Note the distinctive yellow rump, small bill, heavy streaking and forked tail of this female Serin. This female has slight yellow facial markings however it is not uncommon for female birds to have no yellow except on the rump. Also note the birds long primary feathers and brownish back, a good indication that she is not a Canary (see below).